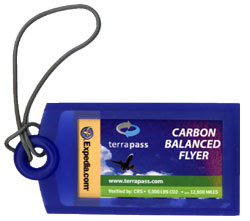 Are you a carbon balanced flyer? Probably not and I haven't known what this means until lately (not to mention how to become one ;) . TerraPass is a prime example for a "Business4Good" and can help you to offset the carbon emissions we are responsible for through flying. This is a smart business approach to the problem that flying contributes to green house gases which I lamented on in an earlier post. Becoming carbon neutral might be cheaper than you think. I just invested 36.95$ for an intercontinental flight from Europe to Australia. The money will go into into green energy such as from wind. You can calculate you emission here, check it out. Just a disclaimer, no this alone won't be the solution for climate change but it's a part of it. What do you think?